Opposition to immigration is typically cited as one of the key factors in the UK’s decision to leave the European Union and the growth of new populist parties across Europe. Nate Breznau suggests there is a direct link between increasing levels of immigration and support for anti-immigration parties. And with many European countries requiring immigration to compensate for ageing populations, the future is likely to see both a significant increase in immigration and a further rise in the salience of anti-immigration politics. The era after WWII was mostly devoid of populist party influence. Instead, Europe was on the mend, and integration at the forefront of European if not global policy agendas. Integration ensured peace. The postwar-prosperity was phenomenal, productivity and social welfare programmes expanded rapidly. Given the changes in the past decades, in particular after the latest European expansion and Eurozone crisis, a new era is upon us. Beginning in the 1970s in Western Europe, populism has risen yet again amidst the waves of immigration that began in the 1960s. The new populist parties are often unidimensional with explicit xenophobic, anti-immigrant positions. Their messages scapegoat non-white, non-native born persons; often with a diametric opposition to Muslims or Islamic culture. In Western European countries, anti-immigrant populist parties – sometimes labelled the ‘populist radical right’ or ‘neo-nationalists’ – expanded from below 5% of the national vote share in 1962 up to 13% by 2017, on average. Note: This chart is based on 17 countries: Austria, Belgium, Denmark, Finland, France, Germany, Greece, Ireland, Iceland, Italy, Netherlands, Norway, Portugal, Spain, Sweden, Switzerland and the UK. Data from OECD, Global Bilateral Migration and ParlGov. The vote share and percentage of foreign-born members of the population observed from 1962-2017 reveals a pattern. They rise in tandem. This is not a paradox of pooling Western European data. In each country on its own, the stock of foreign-born persons explains 50 to 97% of the variance in anti-immigrant party vote share (i.e., the range of correlation coefficients in 17 countries). This does not mean immigration causes anti-immigrant voting; however, social and political research explains why it is part of the causal process. Immigration appears to be the only stable component of new populist parties and their limited policy victories. Thus far, new populist parties have successfully ushered in policies banning or criticising inter-ethnic marriage, the construction of Mosques, immigration flows and the human right to asylum (to name a few). Meanwhile, the UK voted to leave the EU; the Social Democrats in Sweden, after bleeding votes to the Sweden Democrats, introduced bureaucratic regulations against immigration; and perhaps most dramatically, 12.7% of German voters voted for the AfD, which is now Germany’s third largest party. This marks a new era. The post-war spring season of growth has turned to autumn, with a fall in votes for mainstream parties, falling GDP growth and a potential decline in human rights. Anti-immigration views and aggressive displays of national pride, which might once have been confined to private dinner table conversations, have now moved into the public sphere, on the streets, in the media, and in political debates. The 2014 launch of PEGIDA and the sudden growth of the AfD are evidence of this public sphere change in Germany, the last place on earth one expects to find populism. At least 5 million Germans lost their lives under populist leadership last time around, not to mention those from other countries. Once out in the open, history suggests that nationalism reproduces itself because individuals see the public sphere as a safe space for them to express, if not grow their dissatisfaction with society and politics. This is particularly acute when rates of immigration are increasing. Immigration provides a tangible basis to support narratives among the media and social networks that then shape the perceptions and experiences of natives. This leads to an increased salience of group boundaries. The native population may feel threatened by immigrants geographically and economically, challenging both group and national identities. These feelings magnify when native populations face increasing risks to their social and material security, a situation that lower income workers have had to confront since the 1980s due to a combination of economic crises, stagnant wages and welfare state retrenchments. Thus, redrawing or redoubling group boundaries is an active response, a defence mechanism built on the belief that the group will prosper if other groups are marginalised. This belief then fuses with the rhetoric of anti-immigration parties. As Figure 1 shows, this effect is likely a function of the number of immigrants in wider society. Note: Observed and predicted data from the OECD for Austria, Belgium, Denmark, Finland, France, Germany, Greece, Ireland, Iceland, Italy, Netherlands, Norway, Portugal, Spain, Sweden, Switzerland and the UK. And immigration must continue to increase. The ageing population in Western Europe demands services and resources that the native working-age population cannot provide. 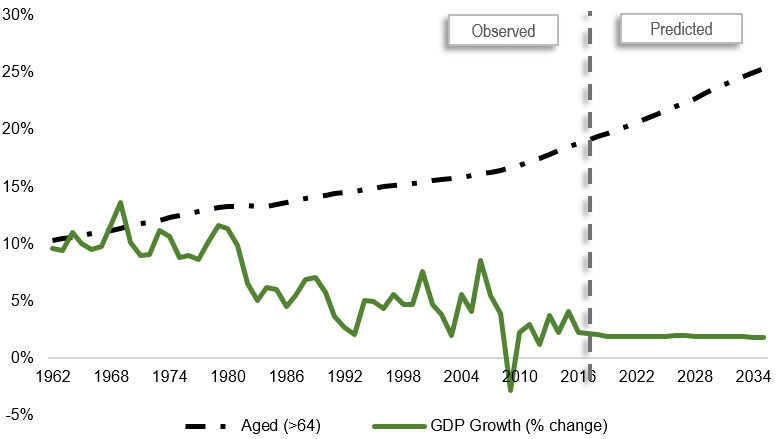 Figure 2 demonstrates conservative estimates of both population ageing and GDP growth stagnation until 2035 from the OECD. Today a country is lucky to have 3% growth on average. Using predictive multilevel modelling and these statistics, we can tentatively predict that anti-immigration populist parties will increase their vote share. The most conservative prediction suggests that the vote share for such parties will cross 15% by 2035, as shown by the solid red line in Figure 1. However, the development of this support follows distinct phases. After an anti-immigration party enters the political arena and acquires support, the average time before it gains 5% of the national vote is 3.2 years (albeit with a large variance). 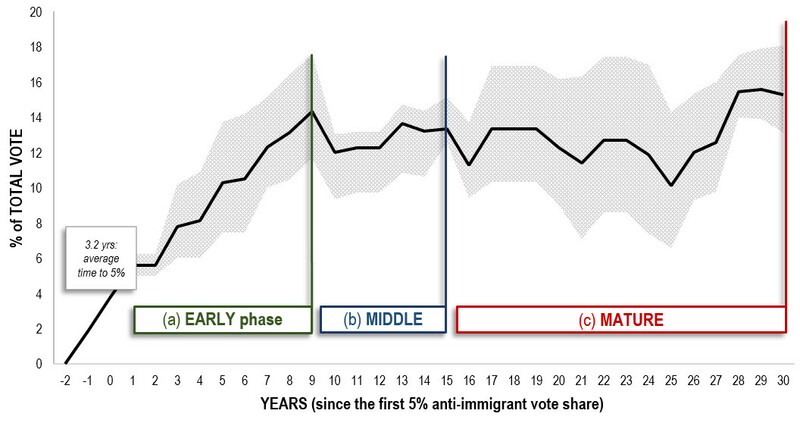 After this 5% threshold is met, anti-immigration parties follow a trajectory of swift gains in the early phase (within 10 years of crossing the 5% mark), stability if not turbulence in the middle phase (up to 15 years) and then ultimately more gains in the mature phase (up to 30 years) as sown in Figure 3. Note: The three country phases include the following countries: Phase (a) includes Austria, Switzerland, France, Belgium, Norway, Denmark, Italy, Sweden, the UK, Greece, Germany and the Netherlands. Phase (b) includes Austria, Switzerland, France, Belgium, Norway, Denmark and Italy. Phase (c) includes Austria, Switzerland, France, Belgium and Norway. Using these phases as an alternative augmentation to statistical prediction, suddenly 15% turns into a 20% vote share by 2035, shown by the dotted red line in Figure 1 after 2017. In most if not all countries, 20% of the national vote would put an anti-immigration party in second place and make it a serious contender as a coalition partner, as seen in Austria’s recent election. Even with UKIP gaining much lower levels of support than this, the UK opted for a drastic undermining of European integration with its vote for Brexit. Meanwhile in other countries, support of between 5 and 25% of the vote for anti-immigration parties has coincided with more restrictive asylum rules or bureaucratic practices being put in place in Austria, Sweden, Belgium, Denmark, Finland, the Netherlands and Switzerland in recent years. A 20% vote share for anti-immigration parties would equate to a roughly 5-10% increase in the overall level of support for these parties in Western Europe. Moreover, if nationalist policies undermine international actors such as the EU or international frameworks such as the Geneva Convention, supranational arbitration will become increasingly difficult as states come into competition with one another. How likely are these estimates? Nothing is certain and exogenous shocks are commonplace. Yet demographic science suggests that increased labour force participation, higher contributions from workers and employers, and lower benefits provided to retirees would be inevitable without an increase in immigration. In hyper-ageing societies such as Germany, the necessary increase would equate to a population where as many as 60% or more of citizens are foreign-born. Using these drastic estimates, the models outlined above also predict a 20% foreign-born population by 2035. Either way, the suggestion that support for anti-immigration parties will reach 15% on average by 2035 is potentially conservative, and 20% support is entirely possible. Populism rises and falls in its myriad variants, but the explicitly anti-immigration version is likely here to stay. This carries additional baggage, as anti-immigration parties take aim at European integration while sometimes allying themselves with neoliberalism as both are in opposition to ‘the establishment’. These parties are not normally anti-democracy, but their authoritarian tendencies, their lack of coherent economic or educational policy and their willingness to foster division are all symptoms of the new season Europe is now entering: a European fall. Nate Breznau is a Postdoctoral Fellow in European Societies and their Integration at the Mannheim Centre for European Social Research (MZES) at the University of Mannheim. His research interests include social policy, public opinion, immigration and social inequality. The European social democratic parties were only pro-immigration so long as it suited the needs of industry. Europe’s borders have never been open to anyone. The history of immigration controls since the second world war shows how the issue of immigration was racialized. European governments divided the world between “civilised” Europe and the non-white Other. Through immigration control they tolerated a certain amount of non-white labour with very limited rights (i.e. guest workers). European immigrants and whites returning from the colonies where never seen as a problem. But non-white immigrants were always seen as second class citizens. It is for this reason that many left-wingers argued that immigration control was the cutting edge of racism – because it blames immigrants for unemployment, housing shortages and overcrowded schools, while at the same time treating immigrants/non-white people as second class citizens. Via the EU and Fortress Europe this division of the world between white EU citizens and non-white immigrants persists today. Rather than just focus on the “extremes”, its the mainstream parties that are anti-immigrant. You have neglected to include the more Eastern European countries, which have the same problem in even greater measure, but not necessarily showing the same correlations. There are nuances whose discussion is perhaps not “politically correct”, especially concerning race, ethnicity and religion. Furthermore, Europe is faced with mass migrations which can best be compared with those circa 400 AD and which have geopolitical, cultural and territorial dimensions ranging far beyond humanitarian and labour market considerations. is that the latest meme from the kippers ? The current issue of the shrinking workforce in Japan alongside its aging population have resulted in a recent need to attract foreign labour to the country. Reforms which took effect in 2015 relax visa requirements for “Highly Skilled Foreign Professionals” and create a new type of residence status with an unlimited period of stay.